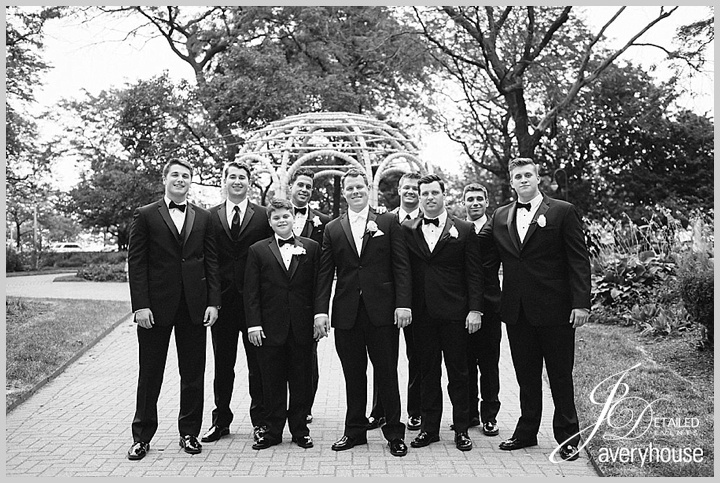 Working with Emily, Frank, and their families was an absolute blast! 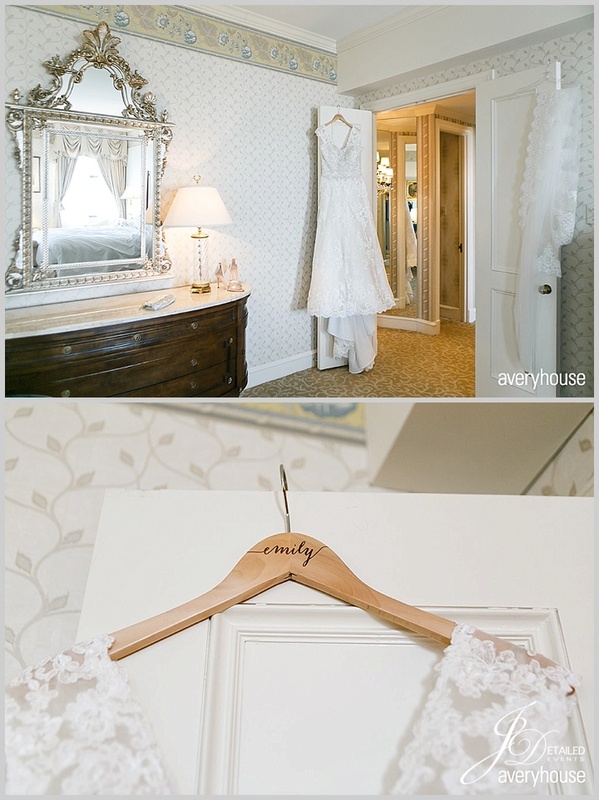 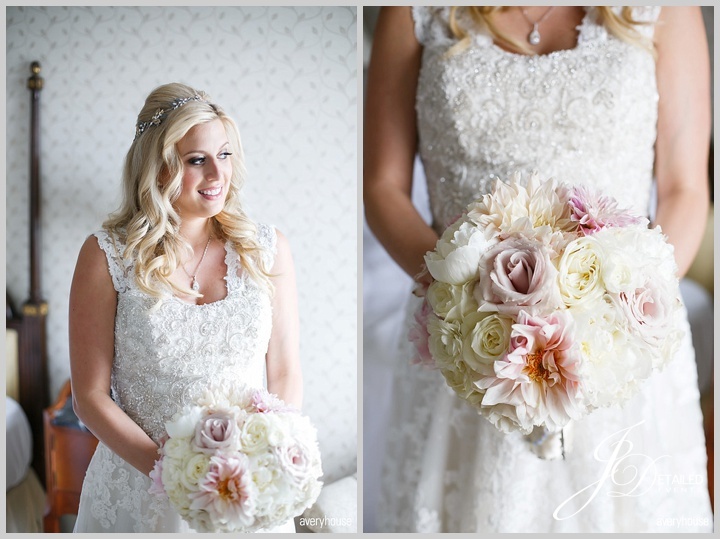 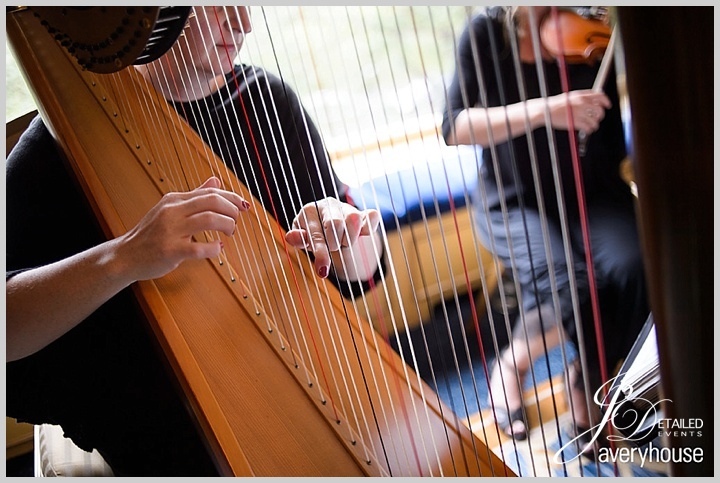 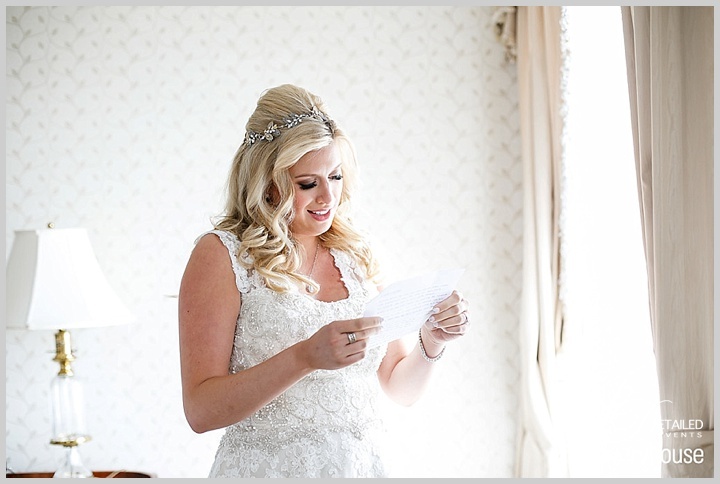 Emily was one of the most excited brides I have ever worked with which made the planning process so enjoyable. 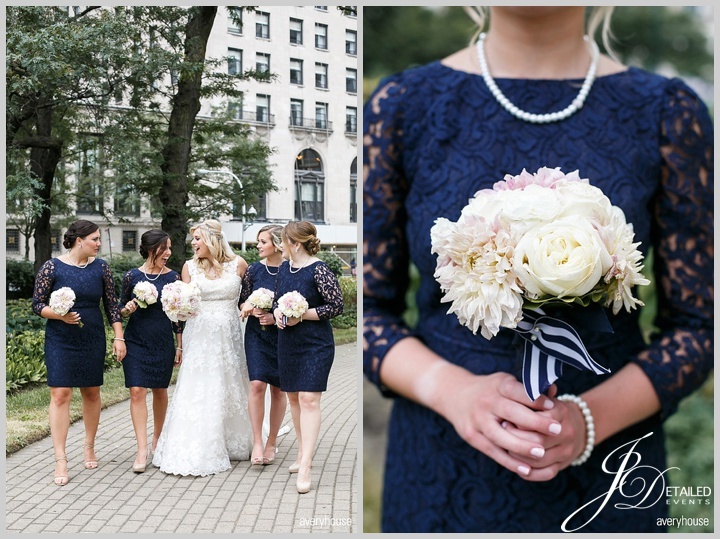 She had a clear vision of what she wanted for her wedding day and we had so much fun bringing that to life! 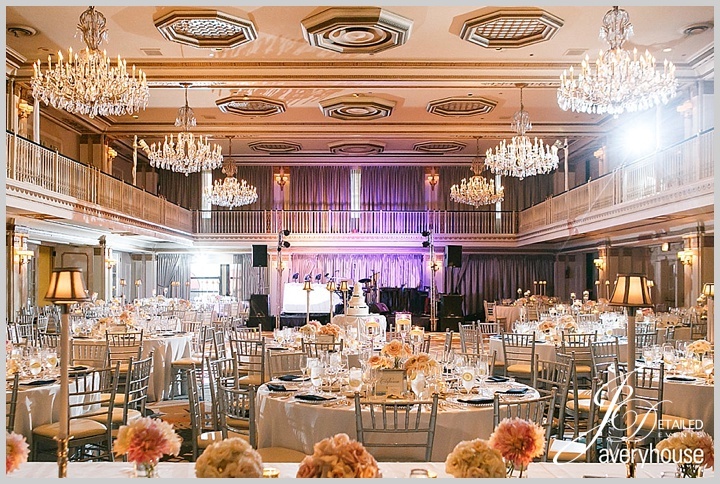 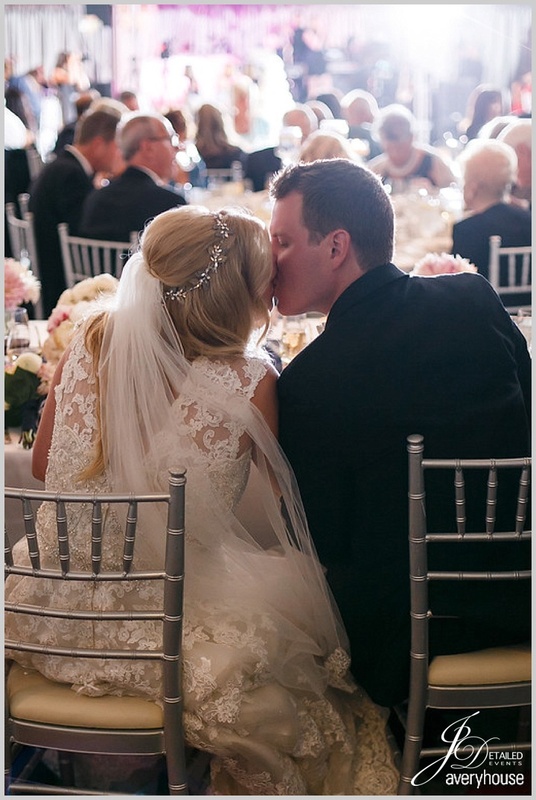 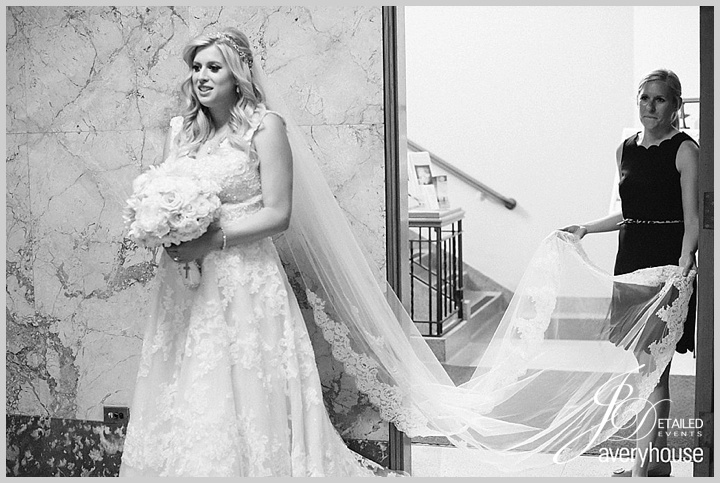 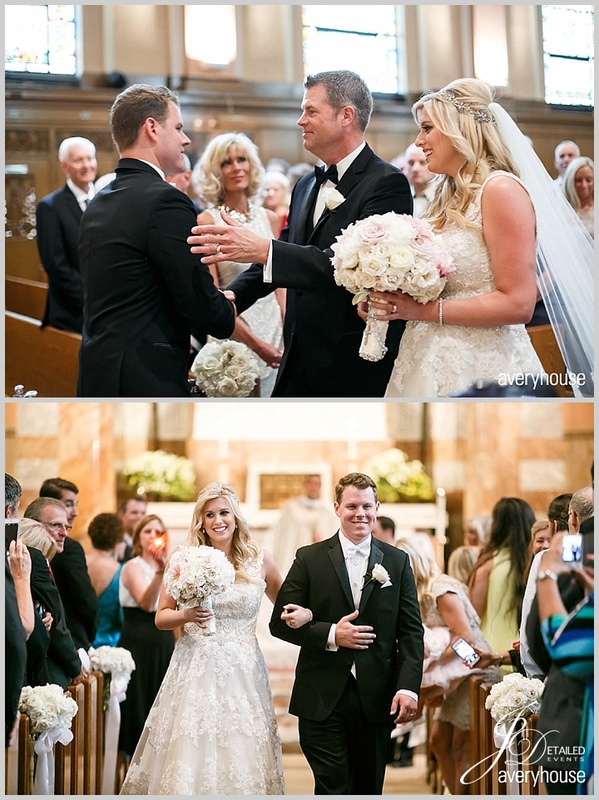 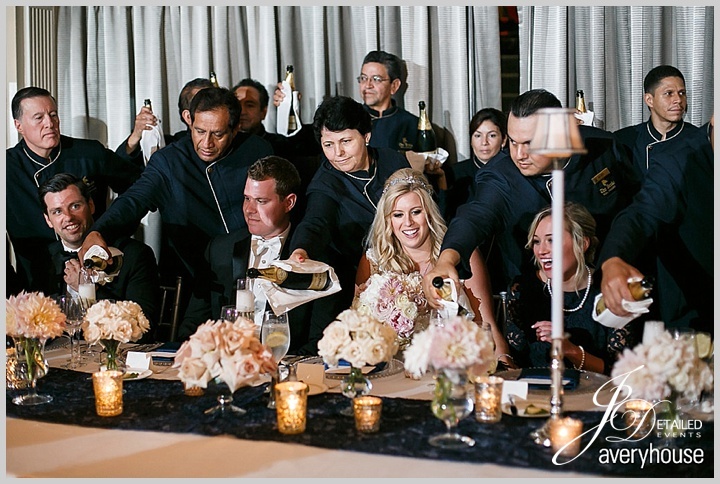 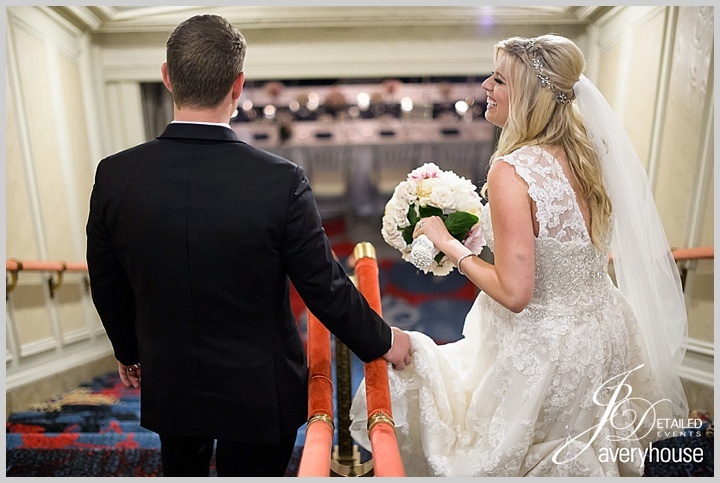 Emily and Frank selected St. Paul of the Cross in Park Ridge for their ceremony and the stunning Grand Ballroom at the Drake Hotel for their reception. 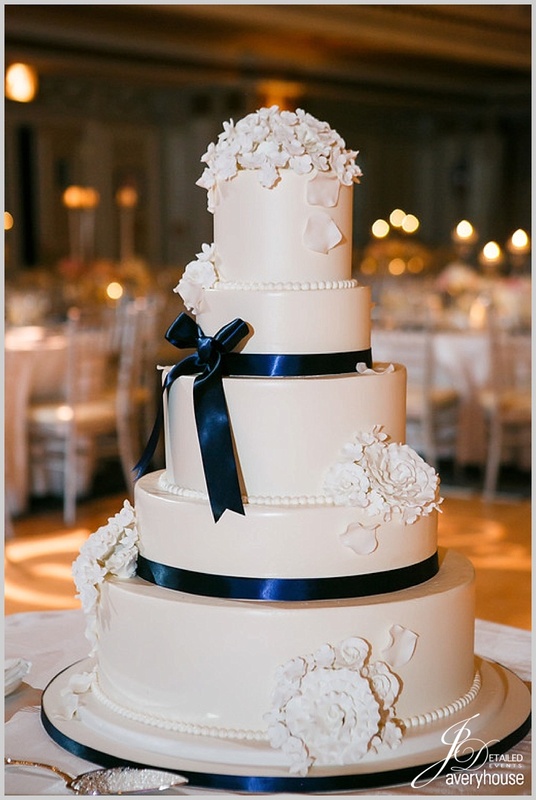 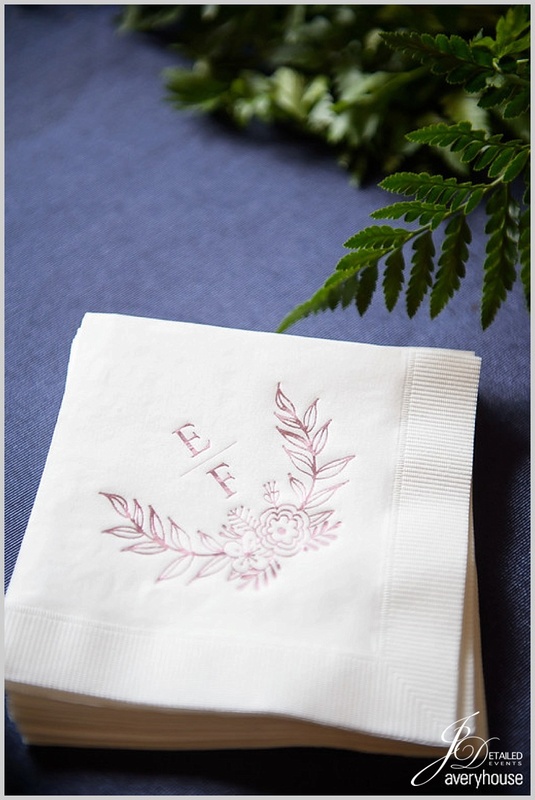 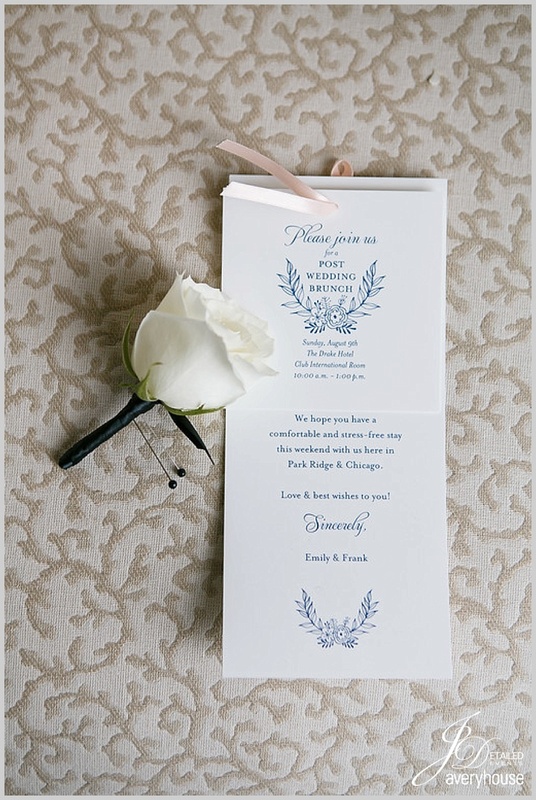 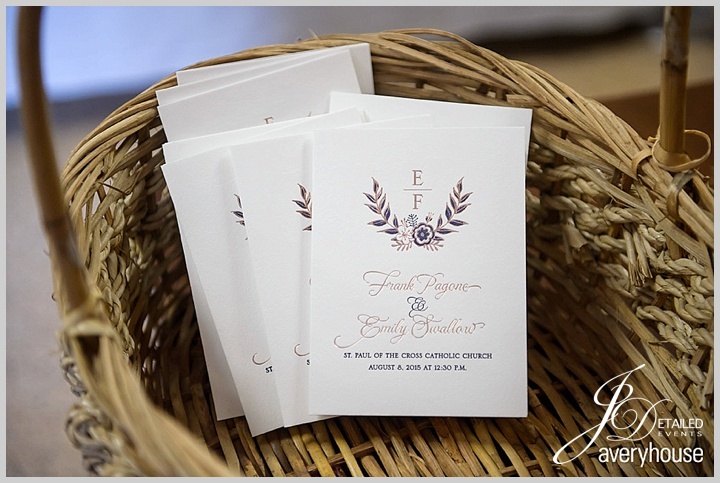 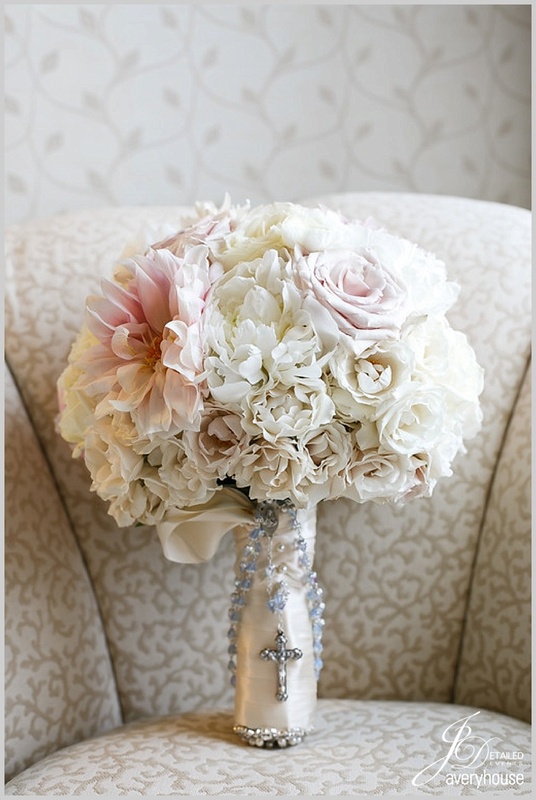 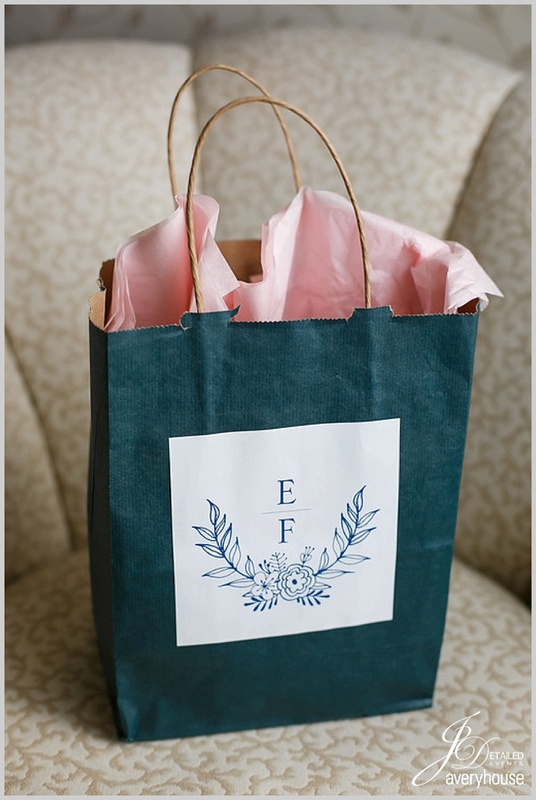 We chose a color scheme of blush and navy that graced everything from the paper items to the floral. 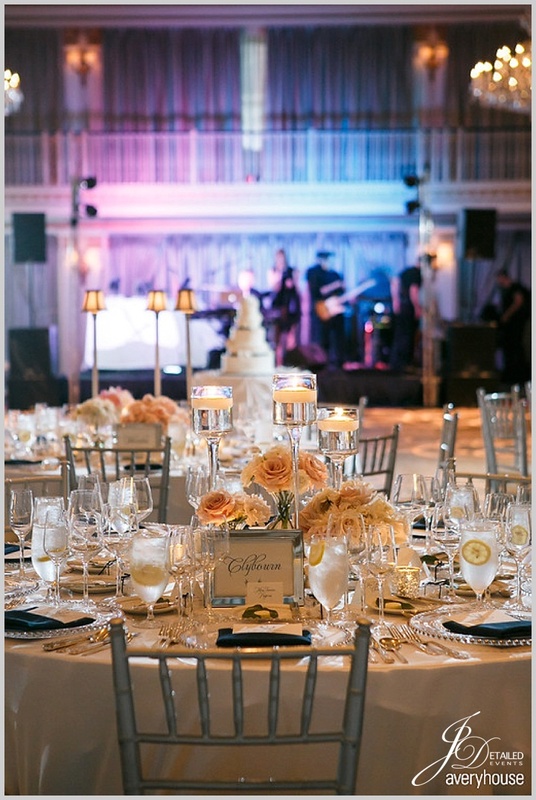 Magnificent Milestones designed a beautiful custom laurel monogram design that appeared on the programs, table numbers, cocktail napkins, and even the seafood ice sculpture display at cocktail hour! 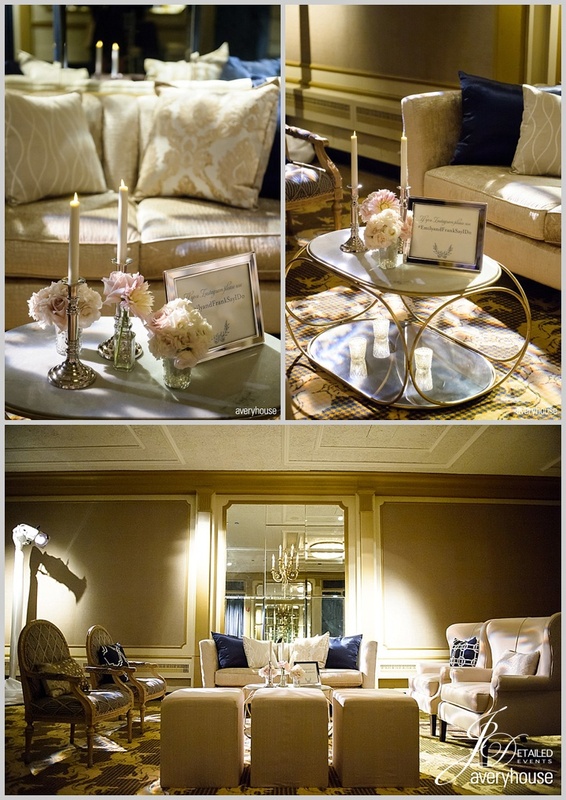 We worked with Kehoe Designs to create Emily’s vision of nautical – but elegant for the decor. 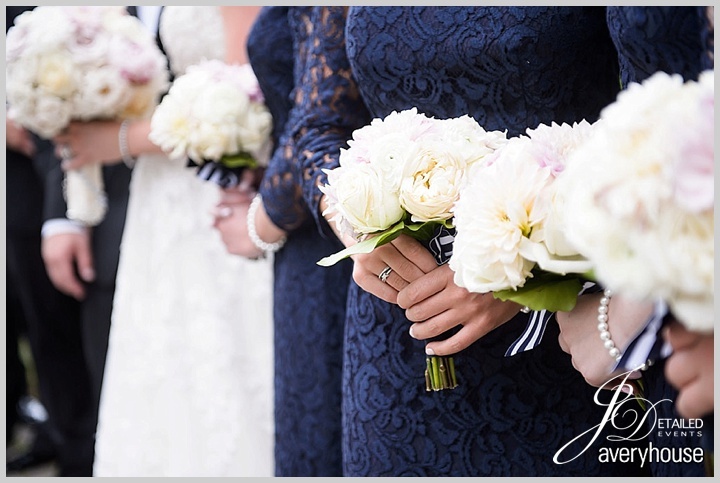 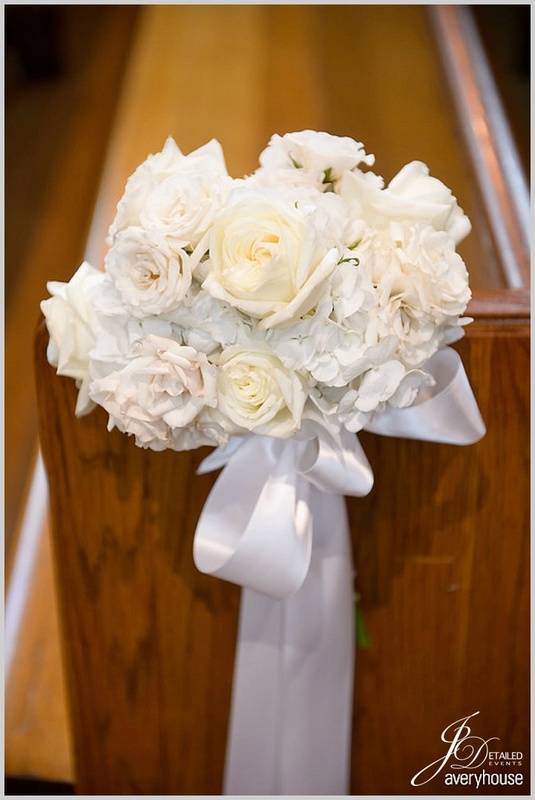 Bouquets were full of peonies, dahlias, and ranunculus wrapped with a navy and white stripped ribbon which popped beautifully against the bridesmaids lace & navy dresses. 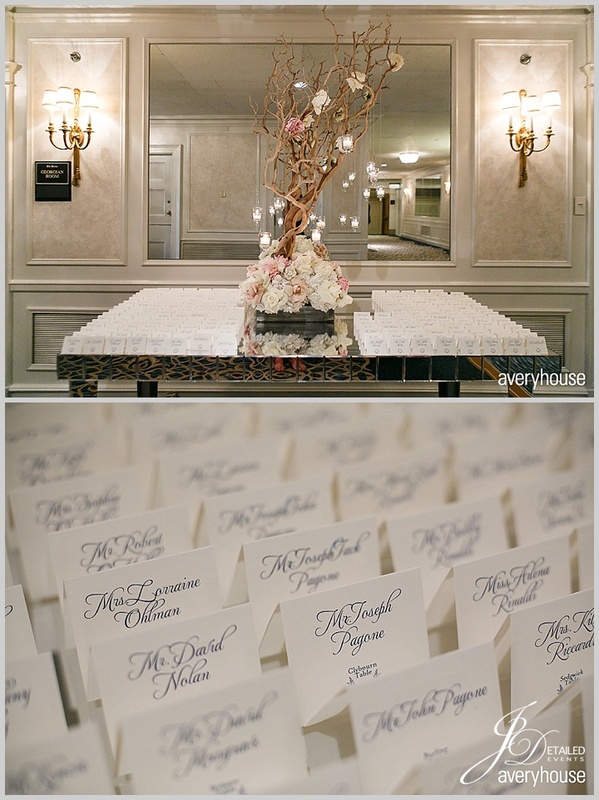 Guests entered the reception to an elaborate manzanita tree with hanging votives and a floral base – a fabulous first impression! 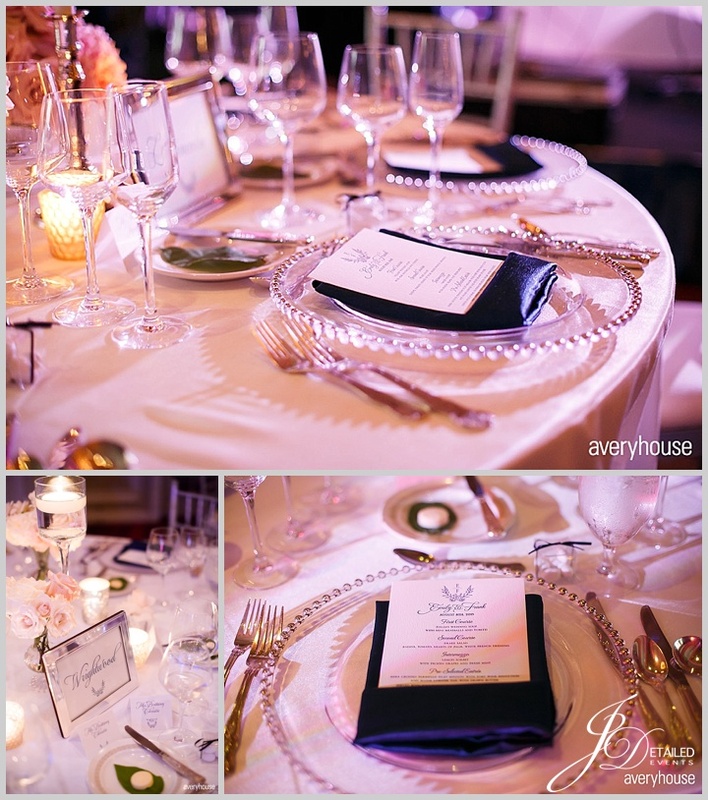 We alternated between two centerpiece designs for the guest tables in the ballroom. 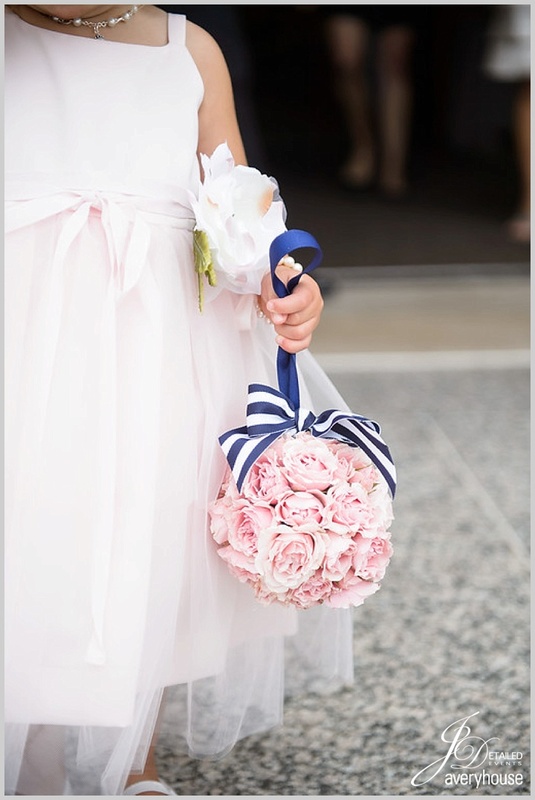 The first design featured navy and white striped lamps with a collection of monochromatic arrangements featuring dahlias, roses, and ranunculus in soft whites, blushes, and pinks. 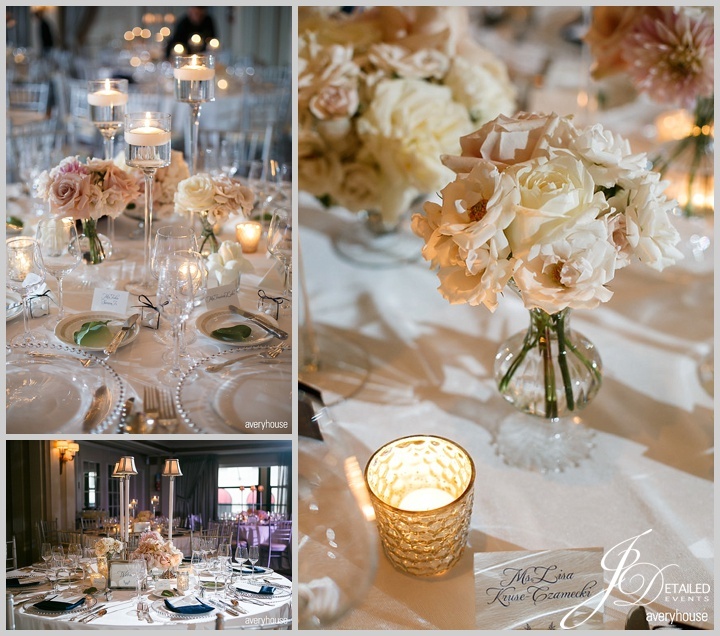 The second design featured a trio of floating candles accented with floral and mercury glass votives. 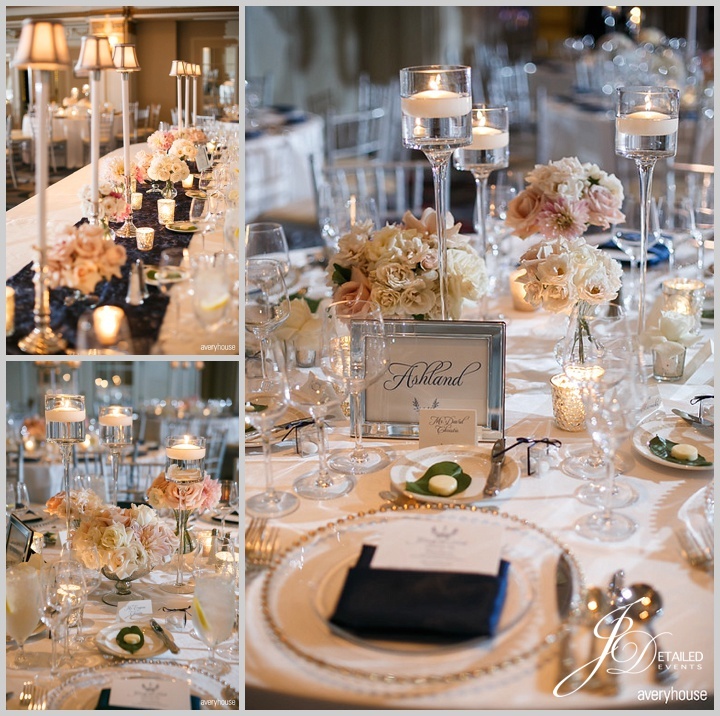 To complete the look, we used silver beaded charger plates topped with a navy blue napkin. 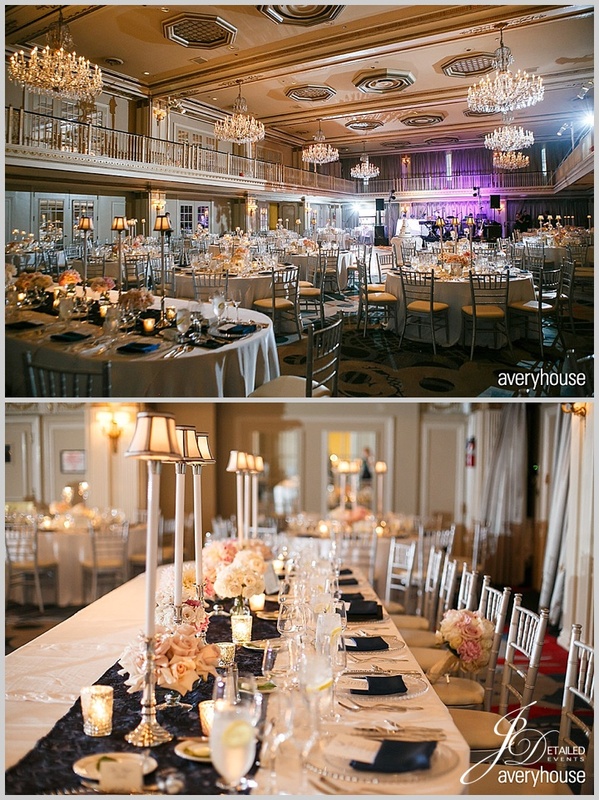 In addition to the gorgeous centerpieces, we created a chic and cozy lounge for guests to enjoy while taking a break from the dance floor. 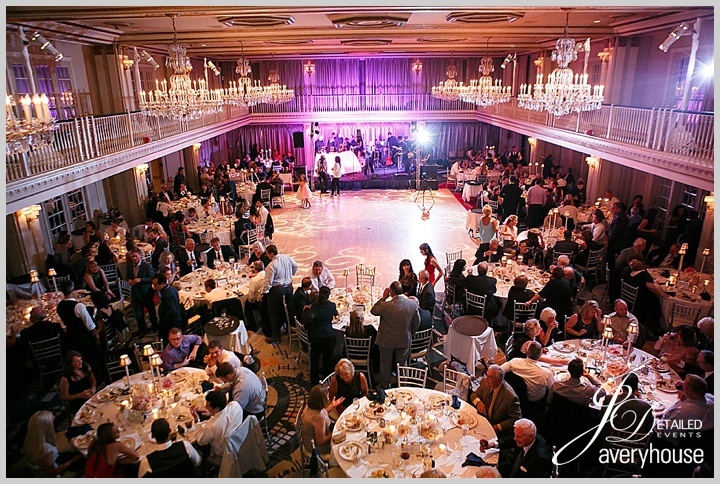 Guests enjoyed a fabulous meal of surf and turf followed by a decadent sweets table and wedding cake before dancing the night away to the music of Final Say. 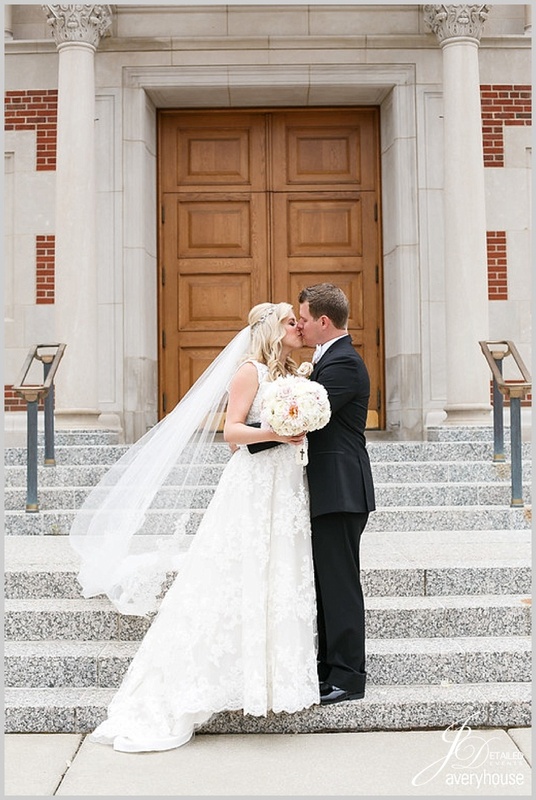 It was a perfect wedding day for Emily and Frank and we wish them a lifetime of love & happiness!